Dog Tricks - Top Dog Videos – Some of the most watched and highest rated dog videos on the web! Boxer dog balances a biscuit on his nose – quite a trick for a boxer, as the drool shows! When you choose to try out some easy dog tricks on your faithful friend then you should apply the same principles of education as you do to humans. You cannot learn to run before you can walk. As such, you need to start with the simplest of tricks before attempting others, such as play dead. 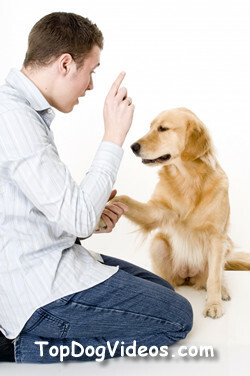 The handshake is the easiest of dog tricks because the chances are that your dog will already do it when begging or wanting a little attention. As such, it is better to capitalise on that right from the start. 1. Have your dog sit in front of you. Let him or her see and smell the treat you have in your hand. Before starting to teach him or her the handshake, give a treat. Do not fuss your dog though or else he or she will be tempted to move rather than staying sat in front of you. This is how teaching all easy dog tricks begins. 2. Now lean down and touch your dog’s paw, slowly rising it so that you are upright and holding as you would when shaking someone’s hand. When holding the paw, say “paw” loudly and firmly. Hold it for a few seconds before releasing it and giving a treat. Repeat this at least five times. 3. Hold out your hand and say “paw” without bending down to pick it up yourself. You dog should then recognise the command and give you his or her paw. When your dog does that then your training for this of the easy dog tricks is almost complete. Repeat this at least five times. 4. Now fuss your dog! 5. Try point three once more. Regardless of whether your dog does it or not, leave training for the day and pick it up a couple of days later. However, start to lessen off the treats after the first couple of days because it should become an automatic response. A very dramatic ‘play dead’ on the Late Show with David Letterman.